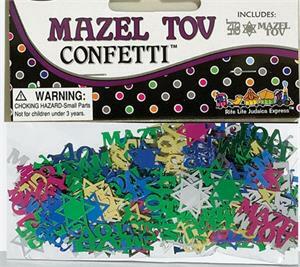 This colorful confetti says "Mazel Tov " in both English and Hebrew and is mixed with stars of David in blue, silver, green, gold and pink. Please note: the confetti shown as fushia is now a soft pink. Each bag weighs 1/2 ounce. When sprinkled around a centerpiece, one bag will do 2 tables. Only 5 bags remaining.